After the Paulie Malignaggi-Amir Khan presser ended Ã¢â‚¬â€œ more on that tomorrow Ã¢â‚¬â€œ the weather in the City was too nice not to walk around a bit, so I stopped over at the NBA Store on Fifth Avenue for a little while. I like to see what initiatives theyÃ¢â‚¬â„¢re pushing, to stay on the pulse of a sport I like, and also to check out some of the more ridiculous items. Also, you never know who youÃ¢â‚¬â„¢ll find there Ã¢â‚¬â€œ IÃ¢â‚¬â„¢ve run into Freddy Prinze sidekick Matthew Lillard and failed St. JohnÃ¢â‚¬â„¢s coach Mike Jarvis, to name a couple. HereÃ¢â‚¬â„¢s a pictorial look at what I found Ã¢â‚¬â€œ or at least, what I found before employees came by and glared me out the door. Note Ã¢â‚¬â€œ If you want musical accompaniment to get the vibe of being at the store, hit play on that dreadful Kesha song after the jump. I think itÃ¢â‚¬â„¢s appalling, but lamentably, thatÃ¢â‚¬â„¢s what was playing when I was there. Brush her teeth with a bottle of Jack, indeed. Above are some paintings they have hanging downstairs. I donÃ¢â‚¬â„¢t believe they were available for purchase. 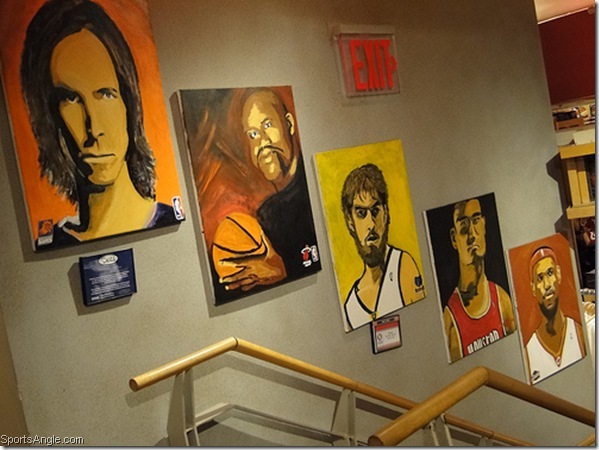 Nash, Yao Ming, Shaq and LeBron I can dig Ã¢â‚¬â€œ theyÃ¢â‚¬â„¢re all wildly popular in multiple countries. But the soft-as-a-pillow Pau Gasol in the middle, I just donÃ¢â‚¬â„¢t get. 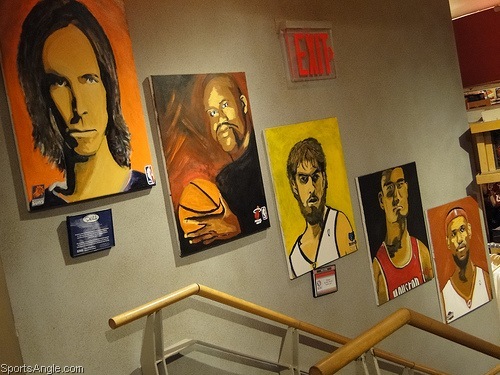 These seem to have been commissioned a few years ago; Shaq was on the Heat on the canvas. So they actually put up a Memphis Grizzlies version of Gasol. Who the hell checked for Gasol on the Grizzlies unless you had him on a fantasy team? The Lakers-era Gasol, I guess, would be okay. I didnÃ¢â‚¬â„¢t investigate further, but the artist had to be from Spain. Some choice items Ã¢â‚¬â€œ The Good, The Bad and The Ugly. The good: Omri Casspi shooting shirt, word to Frank Pepe. I had an extended conversation with some guy named Darnell who worked there, and we agreed that all the first Israeli player in the Association needs is consistent minutes. 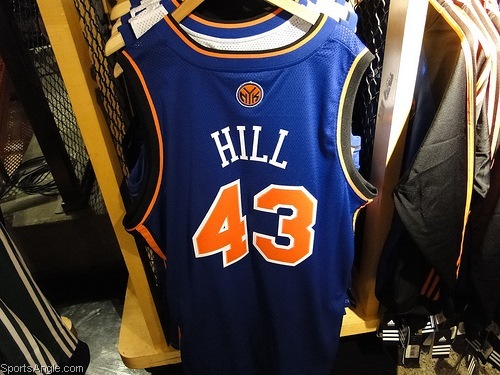 The bad: Authentic Jordan Hill jersey on the clearance rack. This pick was doomed from the start, though watch him turn into a solid player for Daryl MoreyÃ¢â‚¬â„¢s Rockets. 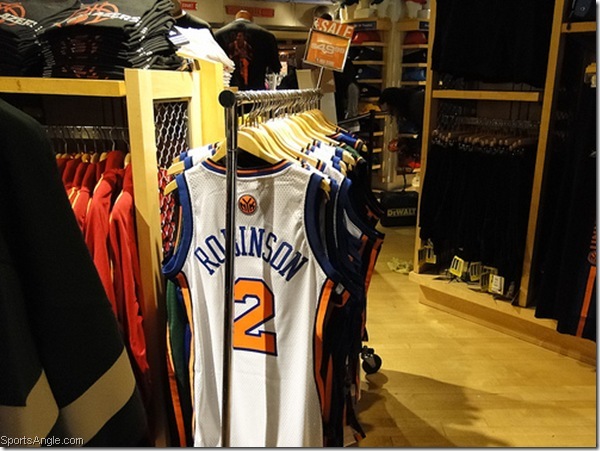 Right around the corner, you can find Tyreke Evans and Brandon Jennings jerseys, compounding the issue. 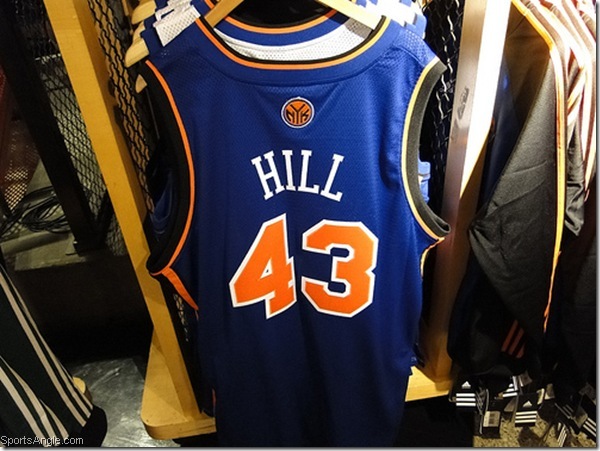 I can actually picture some overzealous Knicks enthusiast having stopped by after one of HillÃ¢â‚¬â„¢s few promising games to drop two bills on an authentic one of these at full price and being furious when he was dealt in the Jared Jeffries bloodletting. Next to join Jordan Hill on the clearance rack? Sergio Rodriguez. They had some Spanish Chocolate jerseys, but they were hidden behind an entire rack of T-Mac jerseys. 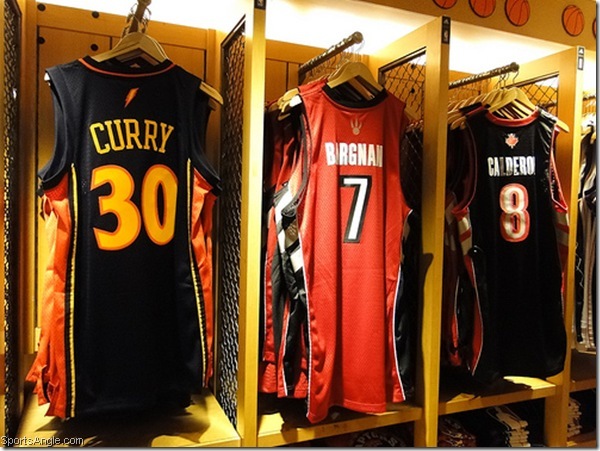 For that matter, T-Mac could also conceivably hit the clearance rack. I didnÃ¢â‚¬â„¢t see any Duhon jerseys (except for the one I own). The Ugly: Tyler Hansbrough swingman jersey. It was prominently displayed in the jersey section, too. Who could possibly want this? 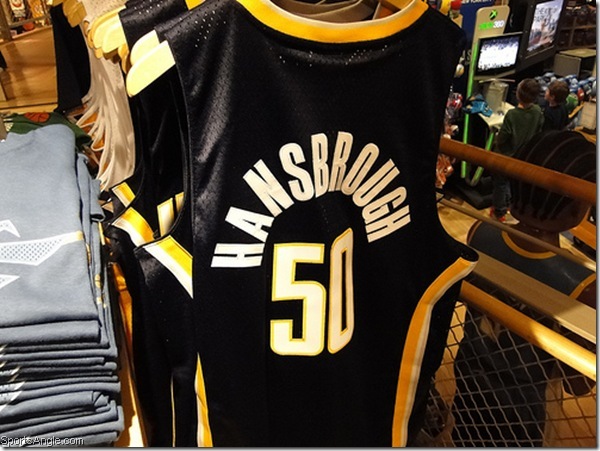 If I ever see anyone in the hood rocking a Hansbrough model, IÃ¢â‚¬â„¢m going to pay him a visit with a box cutter. Sticking with the Knicks deadline deal theme, there were actually two separate racks Ã¢â‚¬â€œ and possibly more, but two that I noticed Ã¢â‚¬â€œ filled with Krypto-Nate Knicks jerseys, some which were actually green. They were marked down from $80 to $49.99, which isnÃ¢â‚¬â„¢t close to a sufficient discount, in my opinion. That should have probably been the price when he was on the team. Nate seemed like a likable guy, I just never really liked him very much on the court. I canÃ¢â‚¬â„¢t stand shirts like this Ã¢â‚¬â€œ with the Yankees and their 27 rings, etc. Ã¢â‚¬â€œ and this one is no exception. IÃ¢â‚¬â„¢m a Knicks fan; I understand theyÃ¢â‚¬â„¢re the hometown team of the flagship store, but the two championships referred to on this Ã¢â‚¬Å“Got Rings?Ã¢â‚¬Â shirt both took place about seven years before I was born. By wearing it, youÃ¢â‚¬â„¢re calling attention to the fact that you root for a failed franchise that is in no way close at this time to making this shirt obsolete. Putting them next to the Bulls shirts just makes it even more of a sucker punch. The only people that should conceivably have a reason to wear it are like 60, and most 60-year-olds probably have better stuff to wear than this anyway. Like pastel slacks. 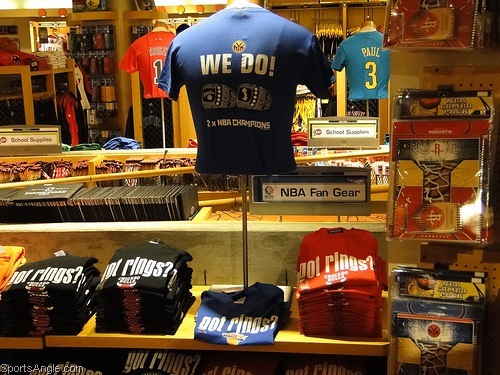 The marketing geniuses at the NBA must have known IÃ¢â‚¬â„¢d be stopping by. 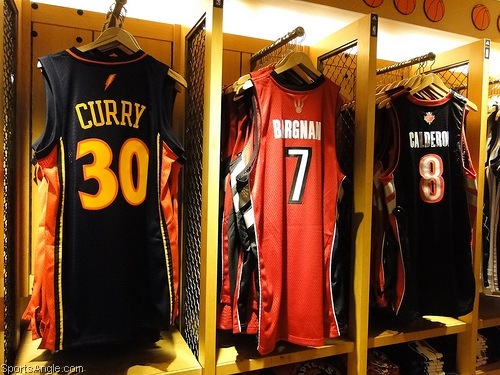 Three of my favorite non-Knicks, non-LeBron players in the league had their jerseys hanging right next to each other. Call it the SportsAngle Wing. I was quite tempted, but I had already reached my allotted jersey quota for the week with a fresh Barry Bonds Arizona State model. 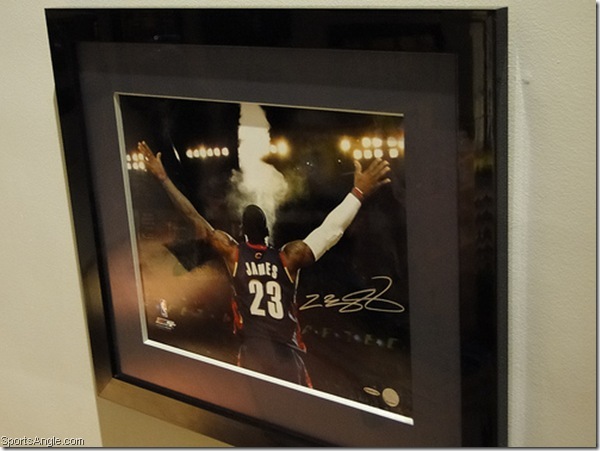 Hung in a winding staircase all the way in the back of the store, they had some signed items on the wall for absolutely ridiculous prices. I think this signed picture of LeBron throwing chalk was like $1,300. ItÃ¢â‚¬â„¢s the greatest thing IÃ¢â‚¬â„¢ve ever seen. Seeing as it was in a completely remote area of the store, I weighed the pros and cons of attempting to stuff it under my jacket, but I think 30 is a little late in the game to start up a life of crime. Besides, my jacket turned out to be not nearly puffy enough to conceal it. 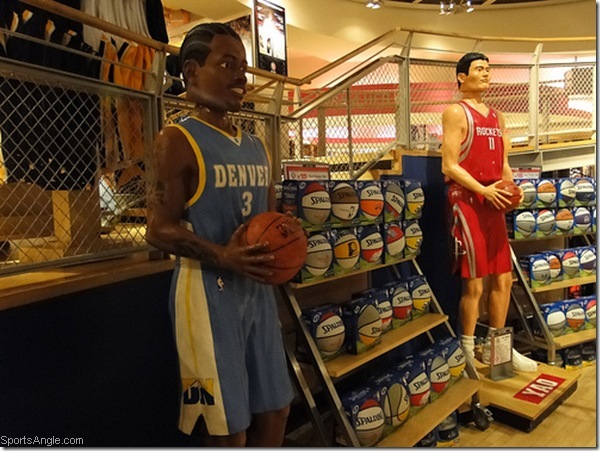 These are Ã¢â‚¬Å“life-sizedÃ¢â‚¬Â bobbleheads of Allen Iverson and Yao Ming. 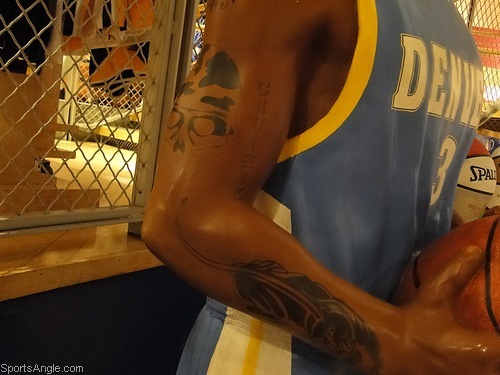 Like the paintings, these are probably at least a year old, based on the fact that Iverson is depicted on the Nuggets, and that Yao hasnÃ¢â‚¬â„¢t actually played a game this season and his whole career is in doubt. TheyÃ¢â‚¬â„¢re set at $800, a price point the NBA should sorely consider slashing. If they were like $50, IÃ¢â‚¬â„¢d absolutely take home Yao for the sole reason that it sort of looks like Frankenstein. 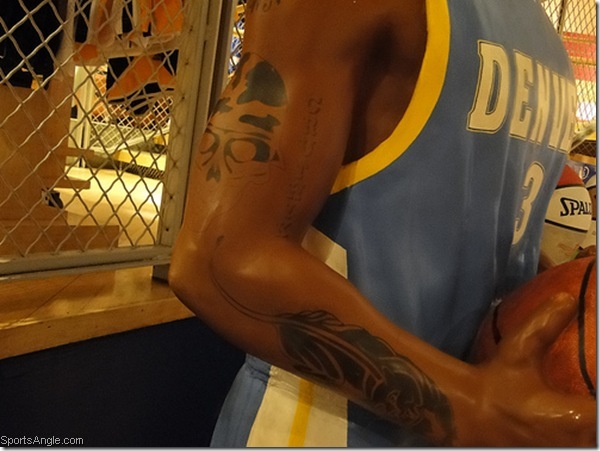 I did give the Association credit for swallowing their pride and replicating AIÃ¢â‚¬â„¢s tattoos, including a skull wearing a military helmet. This is the same NBA that airbrushed them off the cover of a league publication back in the day; theyÃ¢â‚¬â„¢ve come a long way. I would have expected David Stern with his NBA fashion issues (word to Nas) to have ordered the skull and panther changed to ponies and unicorns or something. 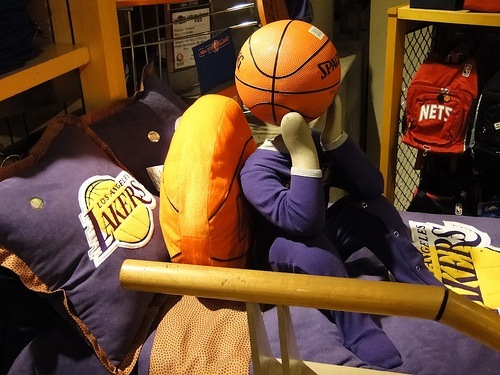 This was some Lakers bedding set they were selling, but I was more interested in the mannequin sitting on the bed, which seemed to have a childÃ¢â‚¬â„¢s body in Lakers pajamas, and a basketball for a head without any facial features. I have to admit it sort of creeped me out, and thatÃ¢â‚¬â„¢s coming from a guy with a four-foot alien in an incubator in his apartment. I thought about making an offer for it, but if I wasnÃ¢â‚¬â„¢t even going to get the Casspi shirt, I had no legit reason to spend any amount of money on this thing. I also just noticed a lone Nets backpack for sale hanging behind the bed. Want to get your kids ridiculed at school? Nets backpack. 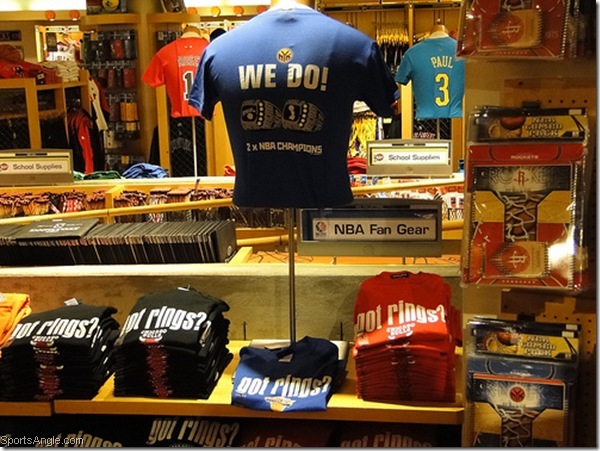 If youÃ¢â‚¬â„¢ve never been to the NBA Store and youÃ¢â‚¬â„¢re anywhere close to the area, you really have to go check it out. 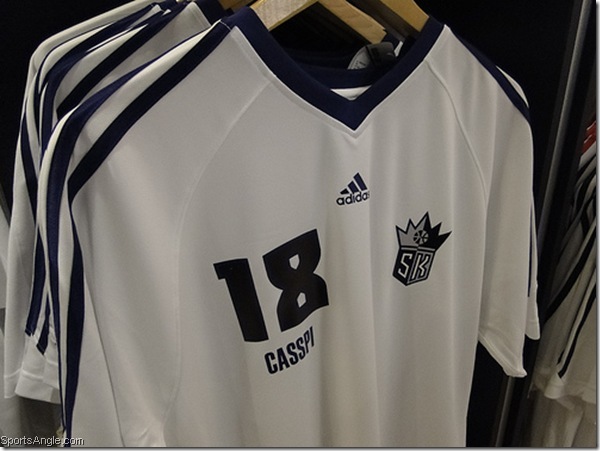 ItÃ¢â‚¬â„¢s an unbelievable testament to the leagueÃ¢â‚¬â„¢s commercialism and their devotion to hammering home their brand image. TheyÃ¢â‚¬â„¢re the only league to have anything like this, to my knowledge. (Unless they have NHL stores in Canada?) Everywhere you turn, thereÃ¢â‚¬â„¢s Jerry WestÃ¢â‚¬â„¢s silhouette in its constant frozen dribble, on coffee mugs and mousepads and pencils. Michael Jordan stares down at you from all sides of the store. LeBron JamesÃ¢â‚¬â„¢ visage lies around every turn. Kobe Bryant is damn near everywhere. The League may be losing money overall, but you can never question their continuing dedication to bellowing their marketing strategy from the rooftops, something IÃ¢â‚¬â„¢ve always appreciated because it makes their stars even more larger than life. Except for the Yao Ming bobblehead. That thing is merely life sized. Good piece. That store sounds crazy.